Also known as visceral fat, belly fat harbors damaged cells. It produces excess hormones and inflammatory substances and contributes to the production of LDL (“bad”) cholesterol and triglycerides. Too much belly fat also triggers a pre-disease state called “insulin resistance,” in which the hormone insulin cannot adequately control blood sugar levels. This can put you at the risk for blood clots. Starting your day with breakfast is an important step in ensuring that you burn calories. Why? While you’ve spent the past 6 to 7 hours sleeping, your body has been working diligently to repair and rebuild itself, which takes up a lot of energy. Skipping breakfast slows down your metabolism because the last thing your body wants to do when it’s hungry is burn more calories, so it goes into energy conservation mode. Yogurt is a great source of calcium and a healthy breakfast choice. 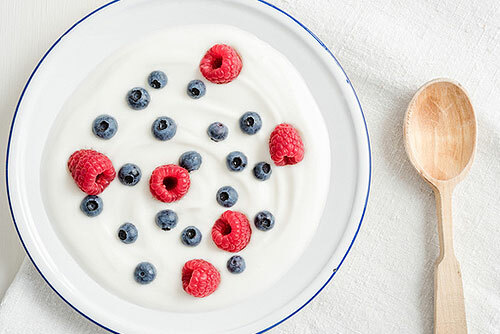 Lately, there’s been a lot of buzz about Greek yogurt because it contains more protein than other yogurts. Protein not only takes a longer time to be digested by the stomach, which helps keep you fuller longer, but the body also burns more calories breaking up proteins. The benefits of green tea are numerous. It contains EGCG, a catechin that helps to boost metabolism. Coffee contains caffeine, which has been show to increase the heart rate, which means you’re burning more calories. (As with exercise, if you speed up your heart rate, then you burn calories.) Another advantage of drinking hot beverages is that you consume them much slower than other beverages, which also slows down the caloric intake for that meal and helps to maintain blood sugar levels.